Satanism 101 – Jared Loughner’s Satanic Video | Stop Obama Now!! Below is the satanic video from YouTube that was the “favorite” of Jared Lee Loughner, the mass murderer of Tucson, Arizona. The clip, features the song “Let The Bodies Hit the Floor” by the rock group Drowning Pool. A “Drowning Pool” was a pool where witches were drowned in the Middle Ages. On January 8th, Jared Loughner attempted to assassinate Congresswoman Gabriela Gifford and murdered six other people. The clip is labeled “satanic” due to the satanic subject matter of the music and the obvious occult ambiance of the clip. That is, it impresses one as “satanic,” whether the group actually worships the red demon, or not. From the death-head shrine found at his home, though, it seems that Loughner himself may have explicitly paid homage to the red demon. Sidenote: The religion of President Obama’s sect in Chicago, based on Black Liberation Theology, is also an occult religion — even though more sophisticated — and part of a wider black nationalist cult movement. Much obvious occult symbolism has been used in Obama’s campaign and administration. These many allusions to the End Times, Obama as Christ and (occult) world transformation into a millennial Utopia is what has excited various occult groups, both for and against Obama. This manipulation of the public via use of occult symbolism and occult themes may well produce, as a side effect, a violent reaction from unstable people like Loughner. It cannot be blamed directly on Obama, but he creates the atmosphere which promotes such events. In principle, there is nothing wrong with considering whether political rhetoric inflamed the situation. However, people should take everything into consideration. Rather than just blaming the Tea Party, people should also focus their attention on the many allusions to the occult that have been made by Obama and his followers and consider the impact this can have on disturbed people, who may be fascinated with the occult like Jared Lee Loughner plainly is. It is bizarre that the media is trying so hard to prove that Sarah Palin, the Tea Party and legitimate political criticism of Obama caused this massacre, but is largely ignoring the obvious satanic occult influences on Jared Loughner. Loughner wore a hood during the shooting, like the subject of this clip, suggesting the grim reaper. Of course, it is not the music that kills people, it is the satanic quasi-religious mindset that this song reflects, combined with a disturbed personality, that kills people. Occultists tend to believe that their actions can provoke a Utopian world transformation and Loughner may believe that this is the purpose of his massacre. If so, the murders of those six people in Tucson can be considered to be a sacrifice, carried out by a disturbed mind in order to bring on world transformation, not unlike the result that the Manson murders and other cult murders were intended to produce. One of Loughner’s teachers said that he returned a test paper with “Mayhemfest” written on it. This is a promotional for Mayhemfest, a rock venue for bands with satanic, facist and Nazi motifs. 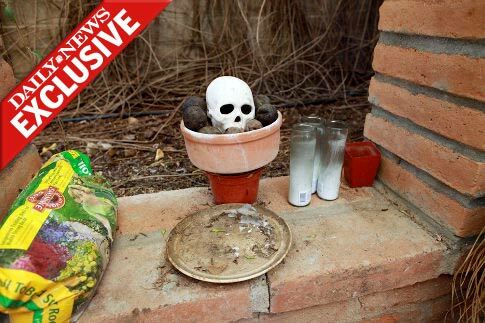 Loughner’s skull shrine reminds one of the Santa Muerte cult religion of Mexico, though there are several other similar occult belief systems along the border. Such cult beliefs are popular among drug traffickers in Mexico and other criminals. Both Congresswoman Gifford and Judge John Roll were supportive of more secure borders and anti-drug measures. Gifford is a conservative “blue dog” Democrat and Judge Roll was a Republican. There has been for many years a large amount of occult religious activity on both sides of the border with Mexico. Left: Richard Ramirez, aka The Nightstalker, was a satanist from the El Paso area. A few years ago several hundred women were murdered along the border, in what was connected to an occult ring. A young American student, Mark Kilroy, was kidnapped, tortured and ritually murdered. His arms and legs were chopped off, before he was killed, and a magical nganga potion made from his brain. Amazingly, the military allows this group, Drowning Pool, to play in combat zones. This is a clip of this satanic group performing for our troops in Iraq. It is rather disturbing that troops in the war zone are fantasizing about this kind of devil music, which also fascinated Jared Loughner, the mass murderer. I have been told that this song is used by the military “to get people fired up” for training exercises. The lyrics and tone of this song would embarrass and shame even a Nazi storm-trooper. Our troops in the war zone are fascinated with this garbage that makes Nazism look tame and the military permits it in theater?? People say they use this song to motivate training exercises. If so, it is a terrible shame that our military has become so degenerate. Bob Hope must be spinning in his grave right now. Shame on the United States for allowing our service people listen to such garbage. They have my daughter in the Army not good. We as citizen’s of the US should petition against this type of behavior. Someone left a comment on FaceBook and said the military uses this song for training. Said it gets them pumped up, before training. This song makes the Nazi stormtrooper music seem innocent. Just read the lyrics to the song. They’re a little violent, but what exactly is Nazi stormtrooper music – Wagner? Also, Bob Hope is implicated by more than a few people of being involved with CIA trauma / satanic mind control for the govt/entertainment industry… I think many “wholesome” things and people are really wrapped up in a degenerate unholy machine, knowing and unknowing. Hello our beloved! I would like to say that this article is wonderful, good written you need to include just about all significant infos. I would like to observe further articles such as this .